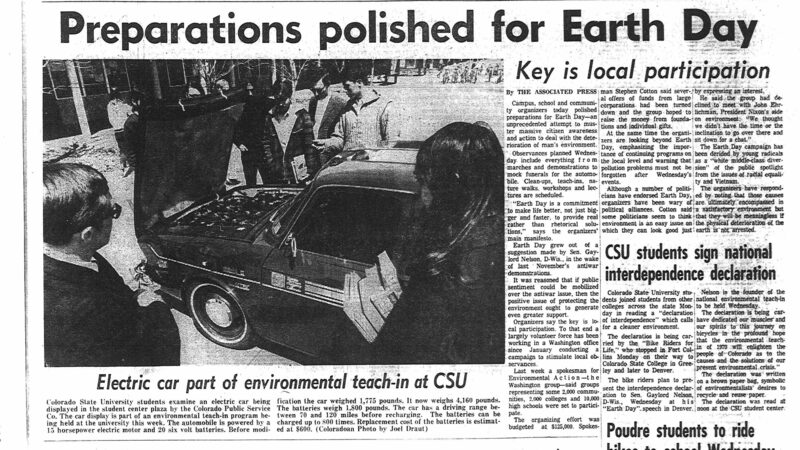 On April 21, 1970, the Coloradoan’s above-the-fold front page was dedicated to Earth Day stories: a national AP piece (“Key is local participation”), a picture of an electric car at CSU (“Electric car part of environmental teach-in at CSU”), and a few inches about students advocating for a cleaner environment (“CSU students sign national interdependence declaration”). This year marked the first Earth Day celebration. According to the AP article above, Earth Day grew out of a suggestion made by Senator Gaylord Nelson, D-Wis. Compare these to the specs for the Tesla Model 3 (long range sedan): 271 horsepower, 75 kWh 350V lithium-ion battery, weight 3,838 pounds, driving range 310 miles, battery charge time 12 hours at 220V. The 1970 article doesn’t mention how long it took to charge the battery, which remains one of the biggest practical obstacles today to committing to an electric car. According to NREL, approximately 8,600 plug-in electric vehicles (PEVs) were registered in Colorado as of the end of 2016. According to Bloomberg New Energy Finance, by 2020 over 120 electric vehicle models will be available to consumers, including the Chevrolet Bolt, Tesla Model 3, and 2nd generation Nissan Leaf. Here’s the Department of Energy listing of charging stations in Colorado. We are so pleased that FCMoD is included.